A future quantum computer, using "quantum bits" or qubits, might be able to solve problems which are not tractable for classical computers. Scientists are currently struggling to build devices with more than a few qubits, with the challenge arising that the qubits mutually hamper each other’s proper operation. 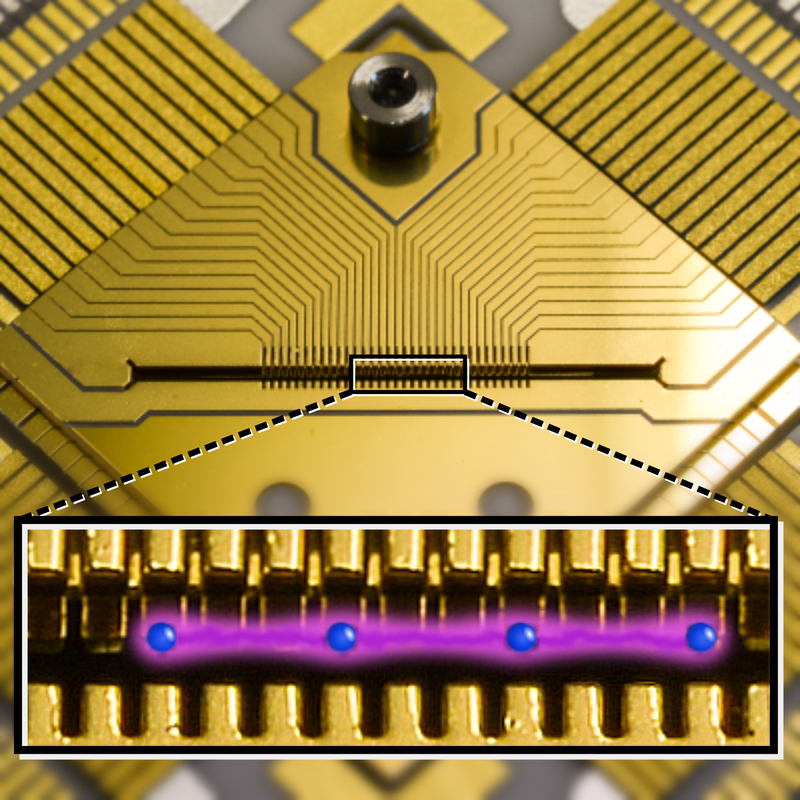 Researchers led by Professor Ferdinand Schmidt-Kaler und Dr. Ulrich Poschinger at Johannes Gutenberg University Mainz (JGU) in Germany have now demonstrated the operation of a four-qubit register comprised of atomic ions trapped in microchip trap. 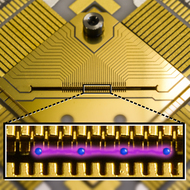 The ion qubits can be freely positioned within the trap, such that laser-driven quantum operations at high accuracy remain possible. The team has realized the generation of an entangled state of the four qubits, where each of the qubits loses its individual identity, but the register as a whole does have a well-defined state. This has been accomplished by sequential operations on pairs of qubits, interleaved with ion movement operations. The resulting quantum state is carried by qubits which are distributed across macroscopic scales of up to several millimeters. The approach for realizing a quantum computer based on moving ions in a micro-structured trap has originally been proposed by a team around physics nobel laureate David J. Wineland and has been coined “quantum CCD" for the analogy with the controlled movement of charges in the devices underlying modern cameras. The work by Kaufmann and coworkers appeared in the high rank international journal Physical Review Letters and marks a decisive milestone for bringing this idea for scaling up quantum computers into the realm of feasibility. Researchers of Johannes Gutenberg University Mainz (JGU) have now demonstrated the operation of a four-qubit register comprised of atomic ions trapped in a microchip trap.